SF Camerawork is pleased to present S P A C E, the 2016 Annual Juried Exhibition, on view from July 14 - August 20, 2016. Featuring artists David Campbell, Theresa Ganz, Amelia Konow, and Jacqueline Woods, the artwork in this exhibition presents an exploration and varied creative, photographic interpretations of the concept of "space." David Campbell's mixed-media photography investigates how human beings confront the massive and incomprehensible cosmos. By manipulating objects and images, via strategies of studio photography, image appropriation and the layering of gold leaf, Campbell's work examines the human quest to place the self within the macro- and micro-levels of the universe. Theresa Ganz's large-scale photographic installations of fictitious landscapes address the often oppositional experiences of scale between humans and nature. Considering the metaphysical possibilities within this dynamic, Ganz builds dense collages of large photographic prints that blur the distinction between the spiritual and bodily experiences of the landscape. 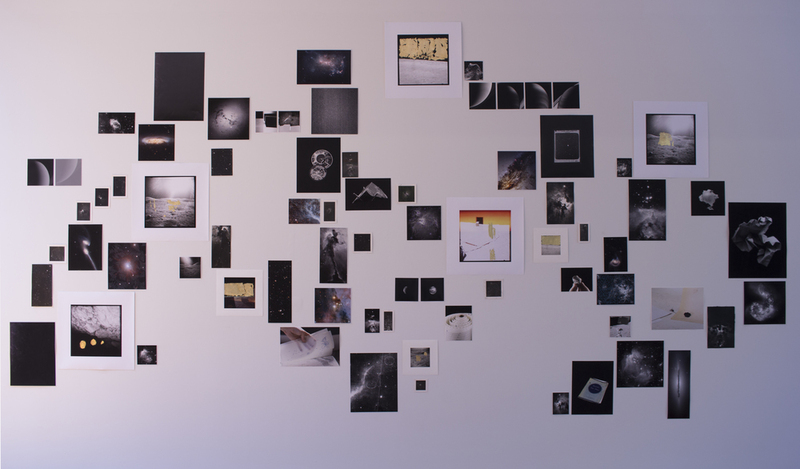 Amelia Konow prints digital images found in astronomy databases onto vintage gelatin silver paper, engaging a dialogue between contemporary science and the nature of photography. Konow is interested in the poetics and mystery of a universe in which much remains to be learned. Jacqueline Woods invokes the supernatural and otherworldly through her camera-less, large-scale photograms. Woods focuses on the elemental relationship between light and darkroom chemistry with an emphasis on process. Her works represent the intersection of control and chaos while alluding to images of the cosmos and the mysteries of the universe. Amelia Konow, V838, 2013; Image courtesy of the artist. Jacqueline Woods, Black Sun Falling Corona, 2016; Image courtesy of the artist. Theresa Ganz, Rock Room, 2016; Image courtesy of the artist. Work by David Campbell, Installation Shot. Image courtesy of Meghan Brabant.